Anthony Modeste has hit the ground running at 1. FC Köln following his transfer from TSG 1899 Hoffenheim over the summer. The French striker has so far scored six goals, earning him instant popularity at the club, where he recently experienced Carnival for the first time. En route to a German language lesson, the 27-year-old spoke to bundesliga.com about his successful campaign to date, what the Billy Goats can improve and what he likes about the city. bundesliga.com: Anthony Modeste, have you recovered well from 11 November? Modeste: Yes, that was my first time and I really enjoyed it. We all had so much fun. It was something completely new for me. It’s something everyone should do at least once in their lifetime. bundesliga.com: What can you still improve? Modeste: Our results at home haven’t been great. We’ve dropped too many points on our own turf. We play every home game in front of 50,000 fans and they deserve more than we’ve given them so far. bundesliga.com: So that would imply that your next game, at home to 1. FSV Mainz 05, will be a very important one? Modeste: Yes, it would be nice to get three points for our fans but also it’d be good for us to show more consistency and cement our place in the top half of the table. On top of that, Mainz aren’t very far behind us in the standings and they’d go above us if they win. That’s why we need to approach the game in a serious manner and give everything we’ve got in order to win it. bundesliga.com: You have already played for a number of clubs, including Angers, Bastia, Girondins Bordeaux, Hoffenheim and now Köln. What is it about the Billy Goats that is different? Modeste: I’ve never been at such a popular club. We play in front of an average of 50,000 fans at home, and they’re all so passionate and live for the club. I frequently see people around the city with FC Köln stickers on their cars. I’m delighted. bundesliga.com: What has been your best experience at Köln so far? 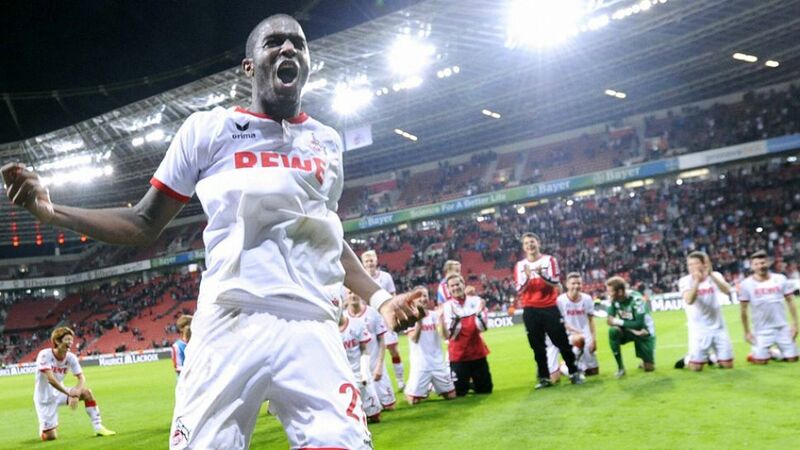 Modeste: Our win at the BayArena. Even though it was an away game it felt like we were playing at home because our fans were so loud. The atmosphere gave me goosebumps. bundesliga.com: There are another five rounds of matches before the winter break. What are your aims before then? Modeste: We want to get as much as we can. If we could stay undefeated until the winter break that’d be great. We want to reach the 40-point mark as quickly as possible. Once we’ve done that we can play with greater freedom and set ourselves higher targets. We want to give our fans a nice Christmas present. That means winning at home. Personally I’d like to score more goals to cement what’s been a good season for me.